A responsive website can help your business increase search presence, build traffic and boost conversions. Responsive web design and development enables your business connect with people without sacrificing content or creating multiple sites. Responsive design is the most flexible solution. It lets your visitors experience your website on any device. At Inflexion Interactive, we design and build responsive websites that display (and convert) well on any device. Since mobiles will outnumber desktops and more visitors access the Web from their phones, you need a mobile-friendly site. Our site is responsive. Check it out using our Responsive Website Tester. 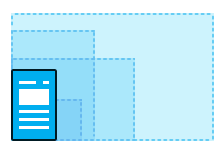 How well does your website adjust to different screen sizes? Responsive web design and development is a key part of Inflexion Interactive’s mobile-first strategy. Our clients want to reach customers on HDTVs, smartphones and tablets. Their responsive websites help them stay ahead of the curve.